Structured cabling is often referred to as Voice and Data cabling, or simply as Cat 5 or Cat 6 cabling, and is the wiring system found in most offices these days to provide the infrastructure for the Company Computer Network and Telephone System as well as many other applications and devices around the office and home. Any Communication device, Multi-Media application and equipment which can reside on a Network, is likely to connect up through this cabling system. Each device can either have its own cabling outlet and dedicated cable back to the central Data Cabinet, or in the case of IP Telephony, you can opt to plug Computer Workstations into the back of dual-port IP Telephones and run them on a shared Network. It is sometimes the case that Company policy is to separate the Voice (Telephony) Network from the Data Network by providing a separate outlet for each telephone and Computer Network Device, and this may depend on individual issues, such as where two different Service Providers look after the maintenance of the Data and Telecoms. In a Structured Cabling System each socket outlet is wired back on it’s own individual cable to a Central Data Cabinet where all cables are terminated, albeit the cables may be linked through other patching cabinets in between in larger buildings. 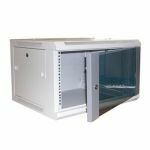 The Data cabinet often houses the Network Switches and Telephone System, as well as other hardware such as Broadband Routers, Servers, UPS etc, that benefit from a neat and secure storage location. This all provides a simple means of facilitating your own moves and changes of eg telephones and PC’s etc around the building without, without necessitating a visit by an engineer, by the simple process of plugging in patch-leads inside the data cabinet. The most common installation practice is to flood wire a building with outlets installed in all likely locations where a Network or Telecoms device may be required, on the basis that it is far cheaper and less disruptive to install the cabling outlets from the offset, rather than piecemeal additions at a future date. The wiring can be installed using copper Cat 5 or Cat 6 cable and also Optic fibre where inter-cabinet links and cable-run distances between cabinets over 100m are required. Cat 5 or Cat 6?